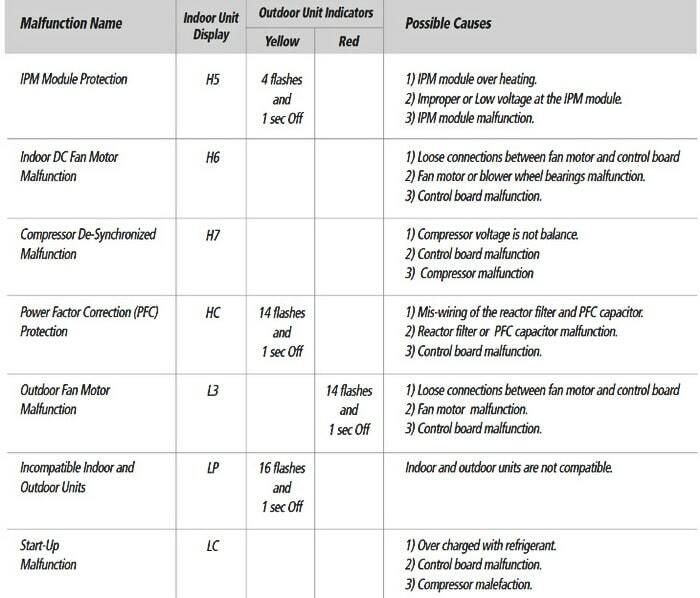 Full list of Gree Air Conditioner Mini Split Units Fault Codes. 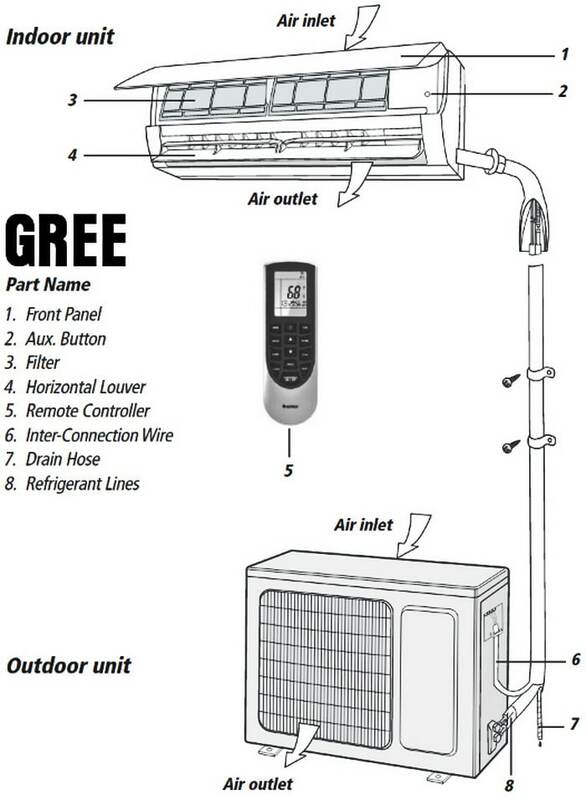 When error codes appear on the Gree air conditioner indoor display, this tells the user there is an issue with the Gree AC unit. The error code displayed will inform you of the issue or problem that is occurring with the air conditioner. Knowing what the error code means and its definition will help you to understand and troubleshoot the exact Gree air conditioner part that needs to be fixed, cleaned, repaired, or replaced. You can then clean, fix, or replace the Gree part yourself and save money. 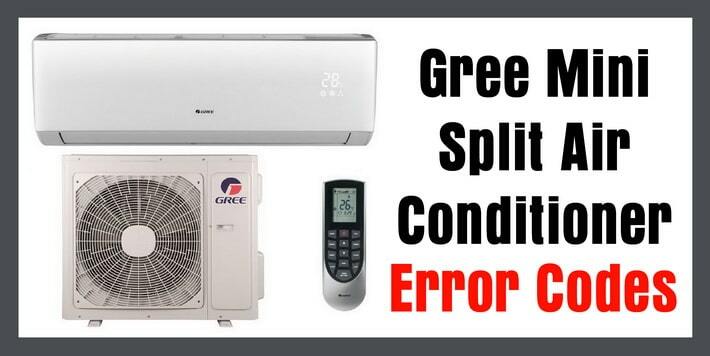 See below for all error codes that can occur on Gree Mini Split AC’s. 2) Indoor coil temperature sensor not calibrated. 1) Over charged with refrigerant. 2) Blocked or dirty outdoor coil. 2) Indoor fan speed is too low. 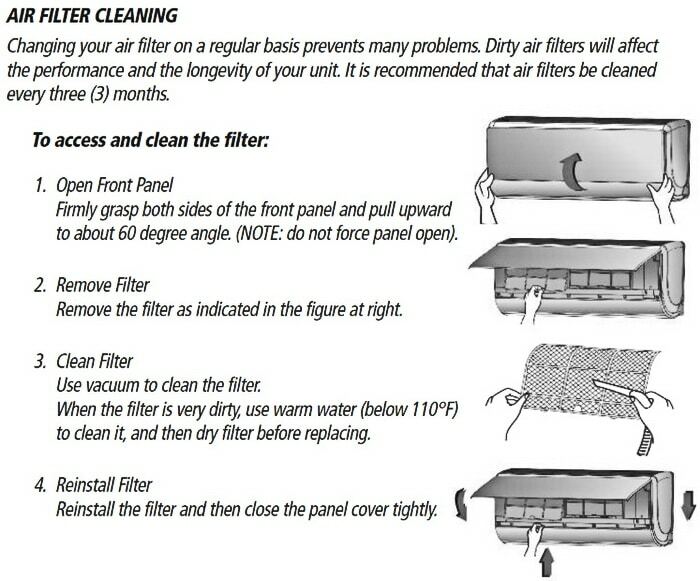 3) Indoor coil is blocked or dirty. 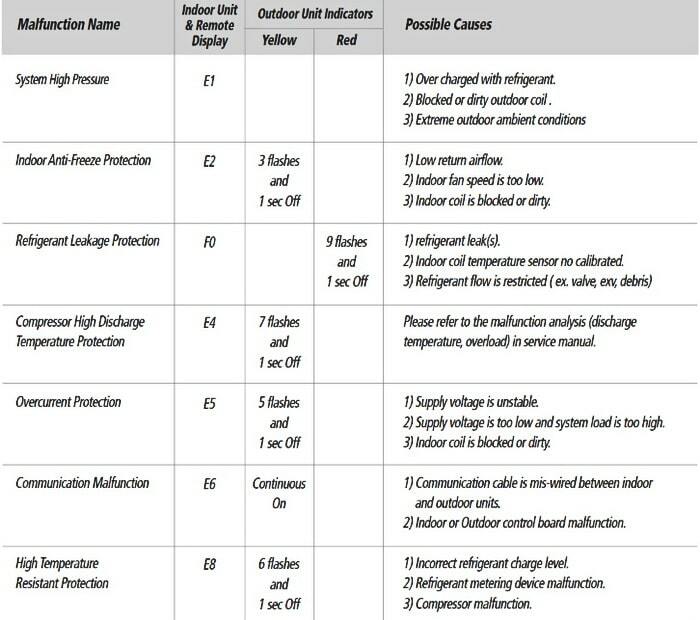 Please refer to the malfunction analysis (discharge temperature, overload) in service manual. 1) Supply voltage is unstable. 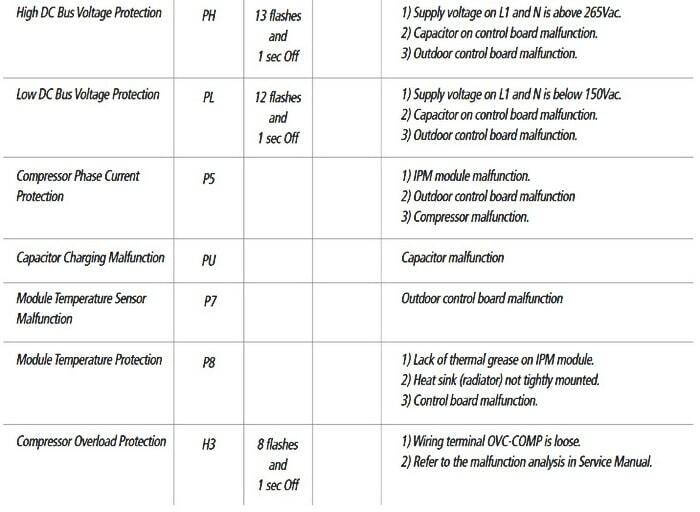 2) Supply voltage is too low and system load is too high. 1) Communication cable is wired incorrectly between indoor and outdoor units. 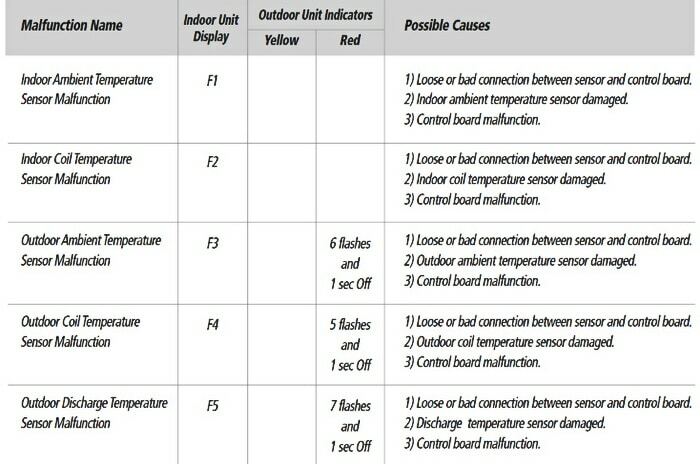 2) Indoor or Outdoor control board malfunction. 1) Incorrect refrigerant charge level. 2) Refrigerant metering device malfunction. 1) No jumper cap inserted on the control board. 2) Incorrect or damaged jumper cap on control board. 3) Indoor and outdoor units are not compatible. Gree AC Vireo Models: VIR09HP115V1A, VIR12HP115V1A, VIR09HP230V1A, VIR12HP230V1A, VIR18HP230V1A, VIR24HP230V1A, VIR30HP230V1A, and VIR36HP230V1A. Need help with error codes on your Gree AC? Please leave a question below and we will be happy to help. I have a Gree mini split model vir12hp230V1B that has E7 on the display. What does this mean. i have a gree mini split model viro9hp230v1b the unit in the bedroom reads E 7 what does that mean? My unit is showing an E1 code. What do I need to do to fix the problem? My unit is showing an E1 code (yellow). What to do to fix the problem? My Gree has b7 on the display panel. Did not see this error in the list. What could cause this error? Somehow it went from Fahrenheit to Celsius how do I get it back to Fahrenheit? I would like to know why my remote doesn’t return the outdoor ambiant temperature, when promted it gives me the set temperature? I HAVE AN INVERTER GREE 18000. I have a Gree Cassette unit AC. When it is off, I can hear gas circulating in the system. After close it half an hour it’s begun work but sometimes it doesn’t work. Sometimes it works after 3 or 4 hours. Sometimes error code H3 displays. Please solve my problem if you can. Gree AC Error Code H3 = Compressor Overload Protection. Check for damaged or loose wiring inside AC unit. Do you know how to use a multimeter? 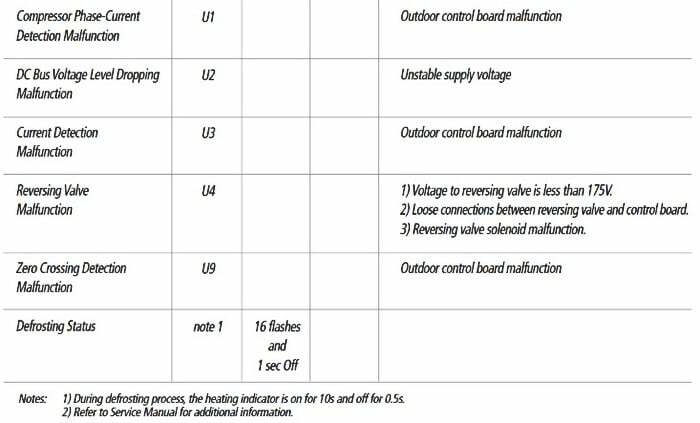 Previous post: Whirlpool Duet Washer Error Code E01 F09 – How To Fix – How To Clear? Next post: Bathtub Shower Drain Is Constantly Clogging From Long Hair – How To Prevent Drain Clogs From Hair?